Painting Acrylic on Canvas | 30" x 35"
Painting Acrylic on Canvas | 42" x 54"
I was never exposed to professional guidance. My only driving factor was my sheer interest in nature and its elements. This interest proved to be my greatest teacher. The secret to a perfect delivery of paintings lies in the painter’s prowess in observing and an eye for detailing. My paintings are thoroughly inspired from real life characters and happenings. I am greatly inspired by the petty characters and episodes of life itself. It does not take in much effort on my part to observe anything that strikes my vision. The view remains within me, and when the time is right, I reflect the vision in my truest possible expression on the blank canvas, trying to retain the actuality of the view, also trying simultaneously to express my inner thoughts. Born in rural Assam, Nirupam Borboruah has carved out a creative niche for himself, despite being brought up in an extremely ordinary lifestyle. 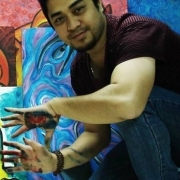 His keen interest in painting and subsequent success in the domain has earned him much accolades. Over a span of 15 years, he has created a career graph which is varied, challenging, and self-gratifying. Digital illustration, animation, colouring and concept art have been his forte. He now works as the head of design and animation in an international organization. Nirupam is working on to have a strong foothold in the field by organising events and exhibitions.